It’s very tempting to draw out an extrapolated exponential curve into the coming months and years. What faults could hold the altitudes down in the short term? 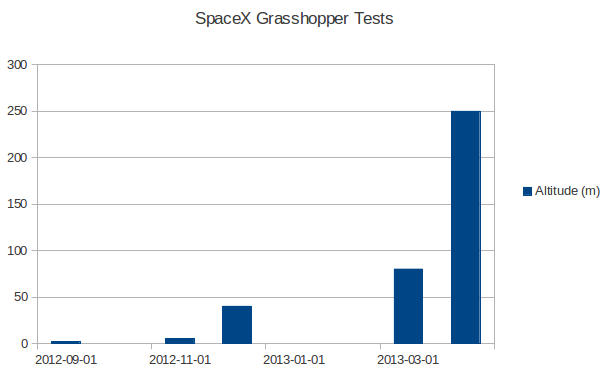 Perhaps a large slowdown after reaching LEO, or even for middle-atmosphere tests? Are they on track to land robots on Mars by ~2018? I think they are. I imagine a future Dragon packed with instruments, sensors, food, water and fuel sitting on Mars in 2020, waiting for a human mission in the early 2020s. Of course, anyone who lands on Mars will have to be careful of planetary-scale duststorms. I’ll try to scale pressureNET out to Mars to help out. This entry was posted in Exploration by jacob. Bookmark the permalink.